Ultra Street Fighter II: The Final Challengers was confirmed for the Nintendo Switch during today's presentation, and now Capcom has given a few more details on the forthcoming fighter. 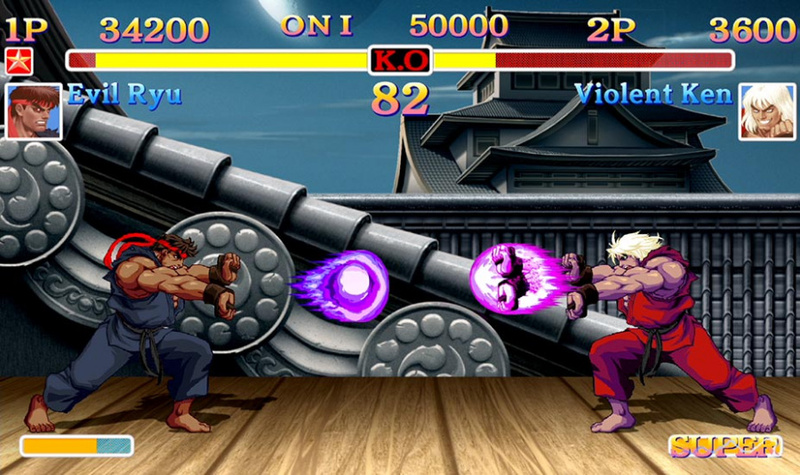 Based on the original Street Fighter II - the arcade smash hit which made its home console debut on the SNES back in 1991 - Ultra Street Fighter II gives you the chance to pick between "classic" visuals and remastered HD graphics created by UDON Entertainment for 2008's Super Street Fighter II Turbo HD Remix. For the first time in nearly 20 years, since Super Street Fighter II, two new characters join the fight; Evil Ryu and Violent Ken. This version of Ryu has succumbed to the Satsui no Hado and is now obsessed with fighting in order to prove he is the strongest. His former honorable self has been purged, allowing him to enjoy absolute power and embrace an unquenchable bloodthirst for battle. Violent Ken is the result of M. Bison kidnapping and brainwashing Ken, enhancing his abilities with Psycho Power and twisting his brotherly rivalry with Ryu into hatred. Violent Ken is more ruthless, aggressive, and fearless with moves that feature purple flames instead of his signature fire. The Switch's Joy-Con pads will allow players to challenge each other in Arcade Mode or team-up to fight against the CPU at the same time - a feature which was introduced in the Street Fighter Alpha series. More modes are expected, and Capcom has stated that it will reveal additional info as well as pricing and availability at a later date. Furthermore, it has been confirmed that Yoshinori Ono, Executive Producer of the Street Fighter series, will be making an appearance during Nintendo's Treehouse Live event today to demo the game. Are you excited about this revival of a classic? Let us know by posting a comment. Wait, Streetfighter 2, new characters & additional Alpha enhancements? Very nice! This is the next best thing to getting Streetfighter 5. Now... how about giving us a powered up Chun-Li? Some of us are speed players y'know! Edit: Also, possible confirmation of more games being revealed at the Treehouse event? This one really weirds me out...like, I don't get why this is a thing? Is there anything special going on with an anniversary or something? Are people still playing this that much? I'm a really casual fan of the series, I don't get why Switch isn't getting V unless Sony has some kind if deal with Capcom for that. @Tsurii Sony apparently paid for a lot of the development of Streetfighter 5, wouldn't exist without them. Also, Streetfighter 2 is considered one of the best versions of the game. Even with the older graphics, it's one of the top fighting games. Streetfighter 4 came to the 3DS, though I wasn't a fan. This was a highlight for me. I'm a sucker for anything Street Fighter, especially II and III. @kobashi100 Who confirmed $40? This could be VC price for all we know. @Tsurii No probs, I was around when Streetfighter 2 first came to the SNES. There are still international tournaments for this game now. Okay, I can't wait to see Maximilian Dood's reaction to this. On the downside, though, I have a problem with this - the exact same problem with Square Enix's Project Octopath: rather than a stellar, flashy, AAA new game or a just-as-spectacular port to bring us up to date with what players are playing on other consoles (Final Fantasy XV in Square's Case, or as said by @DanteSolablood, Street Fighter V in Capcom's case), we always get what feels like the gaming equivalent of leftover food. Sure, I shouldn't be so bitter, but right now "you Nintendo fans settle with lower specs and graphics because you love your nostalgic fix, so we made this side-project for you to enjoy" is all I hear from certain developers. Skyrim is a late port, but at least it's also a game Nintendo players have missed out on. On the other hand, as far as official releases (read: outside of emulators) go, we already got the SNES version of Final Fantasy VI with the Wii Virtual Console a while ago, even taking the usual USA-Europe temporal gap into account. Bravely Default at least went the polygonal route and gave 3DS players a taste of classic JRPG action mixed with the DS FF remakes' presentation. And much like Octopath, now this comes across as... I don't know. If Capcom wants to sell players Street Fighter II yet again, they oughta go the extra mile with the additional content. Otherwise, this rehash won't be justified. "Violent Ken" just sounds like some dodgy bloke who plays darts at the local. I have this on my PlayStation 3. This was cheap so I assume it will be cheap on the switch too. @AlexSora89 I see your point, though in this case it would have been next to impossible for us to see Streetfighter 5 on the Switch. If Microsoft's big bucks couldn't get a copy, not sure how Nintendo was meant to. However, I do disagree with Project Octopatch. I don't think it's the only thing Square-Enix are working on for the Switch, I think it's an additional game which will satisfy older gamers (one of my favourite RPGs is Final Fantasy Tactics Advance 2, not exactly a graphical powerhouse). Meanwhile, old 4corners can work on a much bigger project. I just hope Nintendo DOES show us something to blow our socks off later on today. Even I was a little winded by the lack of big games this morning. @AlexOlney And surely Evil Ryu is redundant. Ryu means dragon.. so he's Evil Dragon? Not a good dragon.. like the Dragon Who Came to Tea? Because if TV has taught me anything, Tigers only attend breakfasts. @Zanark Lol, if you grew up in the 80s & 90s you took your recolours & you liked them!! Isn't that right Sub-Zero, Scorpion, Lizard, Shadow, Cyrax, Not Cyrax etc.etc. @DanteSolablood Ryu means dragon I think. Anyway..I agree with you about the Squenix game. I don't think it's purely because "Nintendo fans like these games" because that short trailer/teaser looked phenomenal. It doesn't strike me as a "cheap" game to say you support a system but as something that may be a lot bigger in scale than you'd think if you only judge it by it looking like an older game. And Square have a couple games for Switch actually. Dragon Quest X and XI, Dragon Quest Heroes 1+2 and I'm pretty sure that something else is escaping me right now...I Am Setsuna? Is that Square? Japan is getting it day one I think. 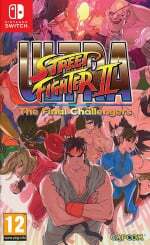 Also, as much as like Street Fighter 2, it would be nice to get some of the other games from the Street Fighter series. I like the visuals that Udon did with the HD remake though. It looks like they used the designs from the Street Fighter comics they made. This appears to be more of a "3DS priced" game as opposed to the "Wii U priced" games such as Mario Kart 8 Deluxe and Breath of the Wild. I like that there'll be a wide range of games on the Switch with variable prices that reflect the quality/content. @PtM Lol, I edited it because that WAS a silly mistake. Think it was something I heard in an animé I loved. Never trust dubs, subtitles for the win! Edit: I stayed up for the presentation & am waiting up for the Treehouse. Gimme a break pleease... I'm normally SO well fact checked. @Tsurii I never meant to insinuate cheap!! As I said, I love FInal Fantasy Tactics Advance... that game was anything but cheap and had a huge wealth of depth. However, I do think there are a lot of people who do like that graphical style. I also think 4EqualSides is possibly holding something back.. doesn't mean they're not going to make Project Osteopath amazing. Well glad to see we be learning more about this during the Treehouse just wish that we could have gotten SF5 instead. But maybe in a year or so we can get it as most exclusive go to other systems at this point. Honestly, its a good beginning. It would have been worse if we didn't get any support, and it was well known that Street Fighter V isn't coming out of PS since Sony paid for its development. The S-E game looks brilliant, for me its a reassurance we won't lose games like Bravely Default due to the new hardware, and it starts to cement the Switch's hybrid nature. I always much preferred the 2D sprite based fighters so this is a tick in my books. Hope they keep all the classic stage themes. @DanteSolablood oh, that wasn't directed at you actually. I guess "budget title" would've been more appropriate. As in, a small, more affordable game. I would take this over Street Fighter 5. Sure thing, but... my fear has more to do with the third-party support. If Wii U's history repeats itself, and of course I hope this is not the case, then the third-party support in the opening year of the console's lifespan will be the only TP support in the console's lifespan, period. And I just want the Switch to make the most out of it, before Pete Hines and other people like him start saying that "Nintendo missed the boat" again. So, in the worst-case scenario this is the only third-party support we're getting, a Street Fighter II re-release if kind of a waste. Same goes for Square-Enix's games, especially given how loyal Nintendo fans who also love Kingdom Hearts have been to the latter. Come on, after all those spinoffs, we deserve at least a port of the two main numbered entries! Before the worst-case scenario kicks in, of course. But as always, time will tell. Let me guess... because of Vega Fabio claw cause a blood ? Mild Blood a bit disturbed me but SF II was my childhood games. I still like to play. Hopefully there is a HD remake of SF Alpha 3. @AlexSora89 Well one thing people seemed to miss is Nintendo confirmed 80 games in development. Now a lot of those won't be due out this year... but that's still a pretty impressive show of support. Personally I think Nintendo is being Nintendo... they have something great & are presenting it in a weird way. During the presentation we heard about 2 launch games & now more games are trickling out when the world's eyes are off of them. I think they spent too long on their new IP (1 2 Arms, Legs & Butts) and not enough reassuring people who were already skeptical about games (their key failing from the Wii U). But again, 80 games & even a quarter of that number this year isn't a terrible lineup. I just hope Nintendo lets us know BEFORE they've cost themselves launch sales. Mild blood probably just means the screen of the defeated fighter where he has a bloody nose and bruise and scrapes? Yay! I'll definitely take this over SFV. Put so many quarters in the arcade back in the day and still play it on VC. So a new version? Yes! I saw the "80 games" thing later, because as mentioned I've watched the individual trailers first and the presentation only a few minutes ago. So yeah, incredible support, but by Nintendo standards even the Wii U's initial third-party support was great, before crumbling into complete nothingness. @AlexSora89 And that's personally why I'm so dissapointed with the presentation. I'm neither going to defend nor sugar coat Nintendo's mistake here.... your last console died because it didn't get enough games, why wouldn't you focus on the games during the big presentation for your new console?? Close your yap and take my cash! The fact that it took Capcom this long to bring back a Street Fighter game for Nintendo home console is just damning. Might as well make the best of it and eat this up while it's good. It's still Street Fighter II after all so it won't bring anything new to the table but hey at least Evil Ryu and Violent Ken makes the list now. Maybe if this is successful, it would open Capcom to bringing more hits to Switch like Darkstalkers, Power Stone, maybe a Tatsunoko vs. Capcom 2, a new Capcom vs. SNK 3, the Street Fighter Alpha series, and Street Fighter III: Third Strikes. A Project X Zone 3 for Switch would be awesome too. Are they gonna throw in Shadow Lady in there too? I love Street Fighter but I wanna see more of this to determine if I wanna buy it. Or I may just stick with Street Fighter V.
Mega excited for this! A dream come true for me. I just hope this is the start of several retro-like releases on the Switch. Hopefully we (as in, us fans, the Switch, and Nintendo themselves, as a whole) will survive until E3, where the console will gain momentum (or, hopefully, further momentum). If there's a Saturn style 6 button pad coming out for games like these then I'm sold...this must be part of their "revisiting old licences" series. I never liked these graphics, I hope they have an option to go for the pixels instead. Looks a lot better than Street Fighter V. At least it'll have arcade mode day one. I got Street Fighter V when it was half price. For that price it's a good game. My main problem with it is the art direction is so fugly, I thought it couldn't get worse than Street Fighter IV but they proved me wrong. I will definitely get this version of Street Fighter 2 even though I already own the remix version on PS3. Besides the alpha games nothing new in the series has been as good a game to me anyway. Lol: The game notorious for its many, many versions gets yet ANOTHER version on Switch. That's what I was waiting for....not! The simultaneous "ohh" at the teleport reminded me of my youth learning fighting games with my friends at the arcade. Great stuff. @Anti-Matter I thought you didn't like violent games.. This is very good news. Yes SF2 maybe as old as 25 years ago, but it has been refined time and again ever since so it's still amazingly modern yet not. The fact SF at all is returning to a Nintendo console is amazing and shows just maybe 3rd parties will take this console seriously unlike the last two. I'd buy this. SF2 is far superior in any release (as was 3) over 4. @IceClimbers thanks, you're absolutely right! I missed it the first time i read through the article. @Zanark Like all the other COD and Modern Warfare games, right? Evil Ryu and Violent Ken...scream hard on a pillow yessss!!!! Yo Dood!!! The Hype. Can we see Mahvel on this possibly? As long rated Teen, I still allowed. My avatar is a Kickboxer, but I designed into cute Chibi boy. Boxing is also violence too, but I still allow as long still tolerable or safe for watch. Violent Ken's origins are wrong. His gaming debut is in SNK VS. Capcom (non-cannonical) where Ken is possessed by Orochi (the same demon that gave Iori Yagami and Rigal Bernstein their powers). "BUT THEY'VE GOT NEW HATS!!!" By some odd coincidence, I had some time to play a game last night, but not a lot of time, so I wanted something good but quick. That ended up being Street Fighter 2. This looks promising. @JoakimZ it says there's a classic mode, so it sounds like you can play with the old-style graphics. I have mixed feelings on the HD graphics. In some cases it looks good, and in other cases I think it could be better. I'd play with the older style. I would hope for the same option when it comes to the music. I don't have the HD Remix, so I don't know if it's an option there already, but I found some of the new music in the HD version to be very poorly chosen. I agree. I always used the classic audio too. His actual debut was in the Street Fighter II Animated Movie. Obviously Capcom can't directly reference SNK characters but even though they did take Violent Ken from SVC Chaos. I find the original graphics in HD Remix to look bad personally. But I don't mind the graphics when playing the actual arcade original. You think HD Remix was released 26 years ago? This game is so much more than the original Street Fighter II. Despite being late, I think Nintendo fans deserve their own release of HD Remix, and the small bonus additions make it even better. A fitting tribute for the 30th anniversary of Street Fighter? No, but it should still have happened. Does this mean we're going to get another version of Street Fighter 4 on the Switch? Since that has multiple versions as well? @DanteSolablood Street Fighter V still doesn't have my boy Blanka. And other greats. Forget that. I hope they implement tag play for Capcom Vs Marvel 4 with Switch as they do here. For those who don't know you can play as a team against ( so far ) the CPU. But does it still have the arcade mode? Cool! An old school SF2 with a touch of Mugen (I see you Capcom ). Anyways.. I'm looking forward to this and will preorder it when available. I respect a an old school SF more than current ones. Must own for me loved SF2 back in the day! !